This is a Japanese lantern, which is just a ornament in Odawara station.It is a very Japanese lantern. Now we don't use Japanese paper lanterns called chochin in Japanese. 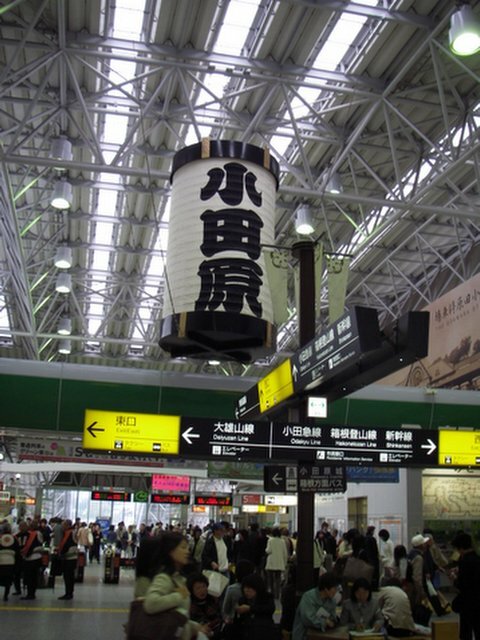 Many years ago, Odawara was very famous city which produceed chochin in Japan. A samurai took forieign tourists's picture. The tourists enjyoyed it. 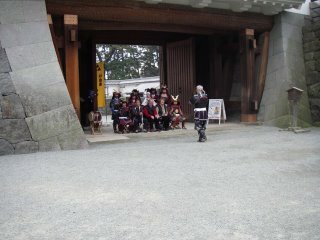 Why did they wear armors?Maybe they were volunteers who like to wear aromrs. 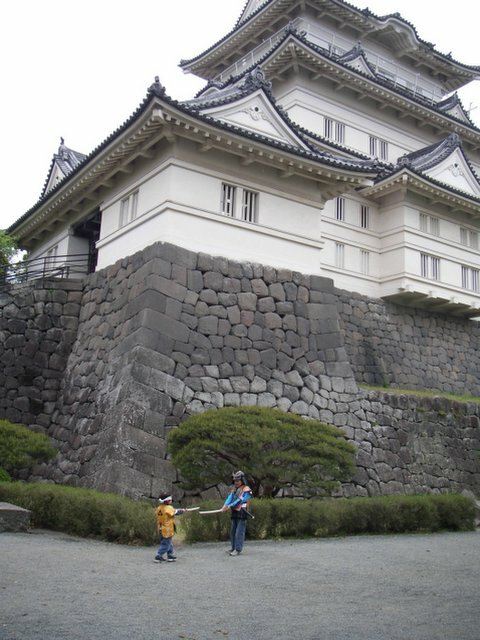 My older son is really into Samurai and Japanese samurai's historys. At first my older son was unwilling to get on the armors. Becase he felt asamed. But actuary he wanted to do it. My younger son asked my older son to do it. "I want to do it. My older son bashfuly agreeded with my younger son. 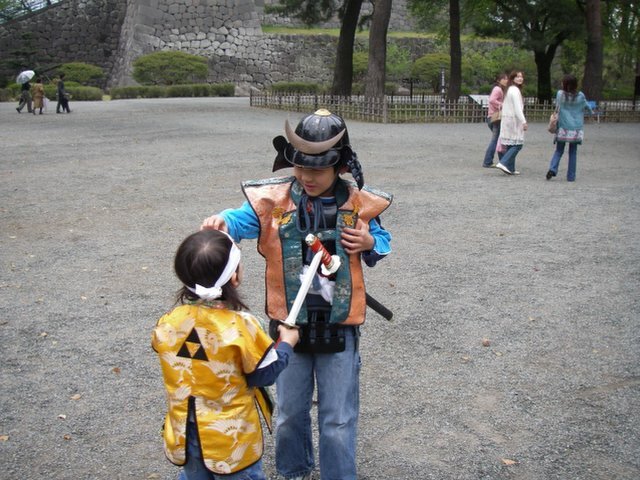 After we came back to our house, my older son said "I enjyoyed to get on the armors. It was most intresting for me today." 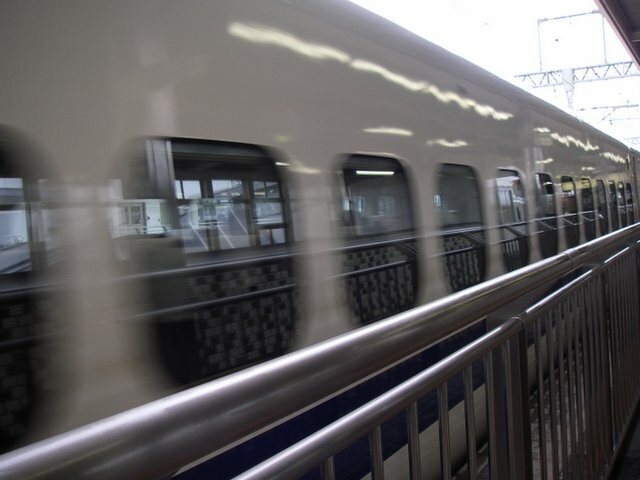 shinkansen can drive at 250 Km an hour. My older son tryed to take a photograh in Odawara station which is in Kanagawa prefecture. But shinkasen was too fast to take a photograh. 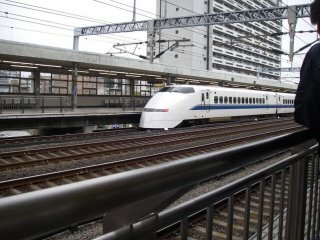 Before one hundred years ago, it took one day from Tokyo to Osaka, now it takes only three houres. 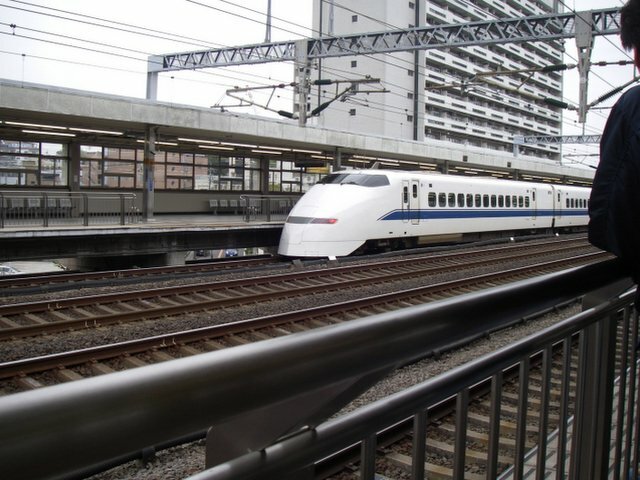 Shinkansen is a major technology in Japan. But we are so hury to do somthing. And we forget the true richness. We should return to old styles like steam engine. Do you like Karaoke ? I was made to sing a duet well with my boss. 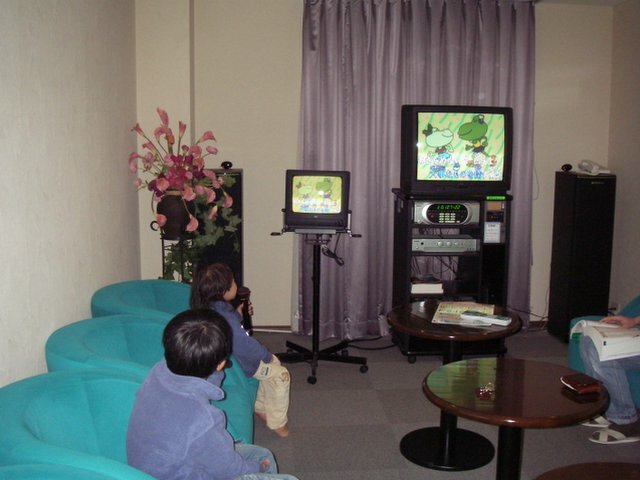 A recent karaoke can generally download music on Internet. And we can choice many kind of songs. We can choice songs for chirdlen. I sometimes go to karaoke with my family. When we went skiing for final spring skiing, we stayed at a Japanese- style hotel, which had karaoke rooms was in Tochigi prefecture. Our sons enyoyed to hold microphones. By the way, do you know karaoke? My English dictionary has karaoke meaning. This is a game called "densha de go" in Japanese. 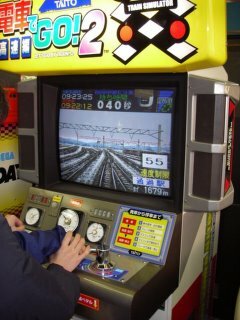 It is a Japanese train simulation. 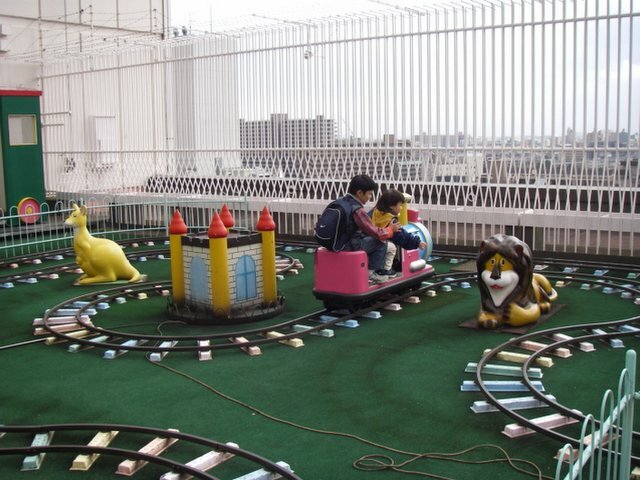 When we went to an amusement park, our sons and thire father tried it. My younger son said "I want to become a train conductor(engineer)". Sometimes I ask my friend to check my English. And I rewrite my posts with red color. When I use this word "Please, I thought it is a polite meaning. Before my friend pointed it. "I would really appreciate, if you read it." My English blog is releasing in world wide. I think it is scary. And I feel embrased. I could edit my link list after a long time. I started to post my blog from last October. First, nobody read my blog. So I tryed to read and post on other people's blog. But it was hard to read them. Actually I am not good at especially reading in English quickly. Second, I searched blogs that had nice pictures or nice person's. It is difficult to know on blogs that are nice people's. Especially it is difficult to know only characters in English for me. Lanternlight commented my blog. But I was not used to set my blog, so I didn't find his comments on my blog. Thank you for Lanternlight. You encouraged me. Kieran posted my blog. I didn't know where he came from. Suddenly he came over my blog at midnight, when I thought it was hard to write post in English. I think he might genius to find new blog. And I met SaWa on Kieran's blog. Thank you for Kieran and SaWa. Recentlry I met Szélső Fa. Thank you for Szélső Fa. I wish I could read Hungarian. I feel happy. I met them. If I just live Japan, I couldn't meet them. My younger son needs diapers, when he sleeps every night. He is four years old!! But he insits he needs it. My older son told his friends in his school about it. My older son's friends said "we don't believe that." We were so surprised. And we thought it would be hard for him. Next morning he got up. He said proudly " I did it!!" I thought it is not bad for children to have siblings. Why is it good to be a younger parent? I am not a young mother. I think it is good to be a younger parent because they have more vitality. I always can't move quickly follow(keep up) the children. I just call their names loudly(in a loud voice) voice. I know that is rude manner in public. Ex. supermarket, station, on the rode. Sometimes I make the other people surprised. Because my voice was so loud. I want more vitality like young people. 1.She always feels boring and sleepy. 2.She always feels bored and sleepy. It is hard to understand for Japanese. By the way my coworker sometimes takes a nap in office after lunch. Today ,while she was noddding of with the mouse in her hand, she took a nap. I thought she felt bored. But it was not good for her. Always I want to say something for her. But I can't it. Because she is an adult not my child, she should take care of herself. Paul is boring, So I was bored. Do you think children need a cell phone? When I was a student, cell phones were very expensive. Young peple could not have cell phones. Japanese could not believe that we would have cell phones in our future. But now even the children have cell phones. In my opinion, children don't need cell phones. I know cell phones are uesful. If children get email, they can return it. That causes childeren to do bad things sometimes. That's why children shouldn't have cell phones. On the other hand, there are some pay phone in towns. And vicious crimes are increasing in Japan. Anyway I may not say such a thing. We parents make give cell phons which have GPS for protecting our children. My older son came back from his mother's house. My sister- in-low brought him to our town neareby. And we went to an amusement park of the roof of a department store. And they took the trains. 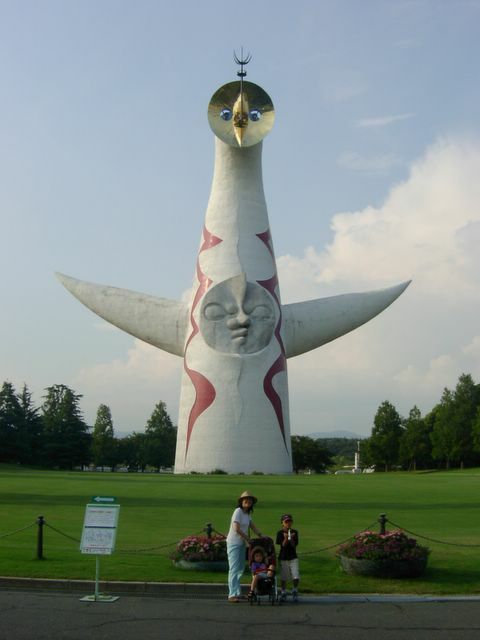 It seemed that my older son really felt shame. He covered his face by his hand someteimes. The other side my younger son was very satisfied. 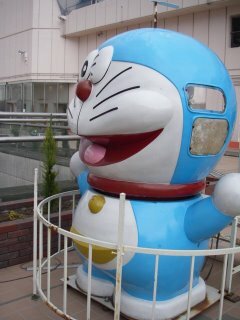 Doraemon is a very famous character in Japan. I'm not sure it is a global character. 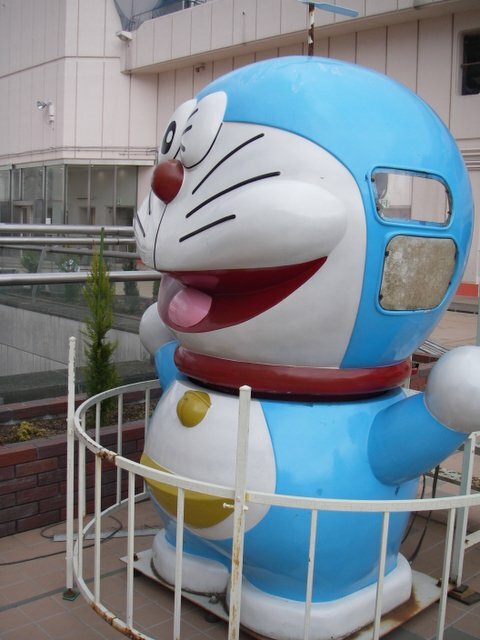 Many Japanese children like Doraemon, whose poket has a lot of special tools. I forgot that today was our wedding anniversaryy. Maybe it is the 10th or 11th. When we married, I couldn't imagin our situation. We are so busy now. Actually I have to make a document of the tomorrow's meeting. And my husband is too busy to spend with my family recently. He also forgot our wedding anniversaryy. I think a married life is such a thing. Anyway we hope we would enjoy ourself next weekend. If my husband take off next weekend, we will go a hotspring? ?